The Mortgage Bankers Association today released its Weekly Mortgage Applications Survey for the week ending December 3rd, 2010. The MBA’s loan application survey covers over 50% of all U.S. residential mortgage loan applications taken by mortgage bankers, commercial banks, and thrifts. The data gives economists a snapshot view of consumer demand for mortgage loans. In a low mortgage rate environment, a trend of increasing refinance applications implies consumers are seeking out a lower monthly payment. If consumers are able to reduce their monthly mortgage payment and increase disposable income through refinancing, it can be a positive for the economy as a whole (creates more consumer spending or allows debtors to pay down personal liabilities like credit cards). A falling trend of purchase applications indicates a decline in home buying demand, a negative for the housing industry and the economy as a whole. The Market Composite Index, a measure of mortgage loan application volume, decreased 0.9 percent on a seasonally adjusted basis from one week earlier. On an unadjusted basis, the Index increased 22.8 percent compared with the previous week, which included the Thanksgiving Holiday. The Refinance Index decreased 1.4 percent from the previous week. 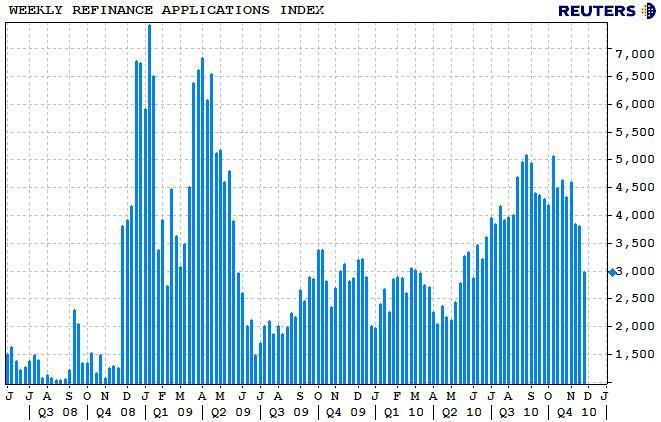 This is the fourth weekly decrease for the Refinance Index which reached its lowest level since June 2010. The four week moving is down 10.9 percent for the Refinance Index. The refinance share of mortgage activity increased to 75.2 percent of total applications from 74.9 percent the previous week. The seasonally adjusted Purchase Index increased 1.8 percent from one week earlier. 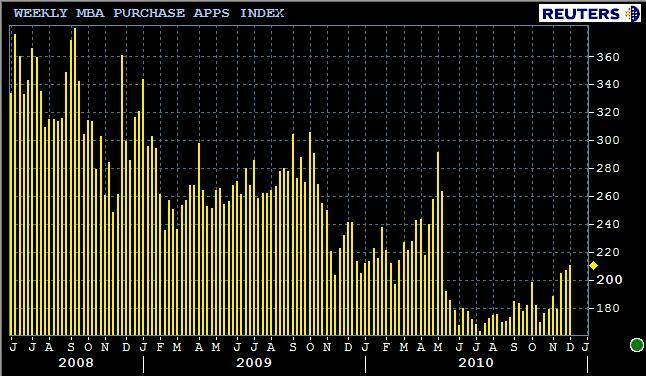 This is the third weekly increase for the Purchase Index which reached its highest level since early May 2010. The unadjusted Purchase Index increased 21.3 percent compared with the previous week and was 12.0 percent lower than the same week one year ago. The four week moving average is up 2.8 percent for the seasonally adjusted Purchase Index. The average contract interest rate for 30-year fixed-rate mortgages increased to 4.66 percent from 4.56 percent, with points decreasing to 0.95 from 0.96 (including the origination fee) for 80 percent loan-to-value (LTV) ratio loans. The average contract interest rate increased for the fourth consecutive week and is at the highest level since July 2010. The effective rate also increased from last week. 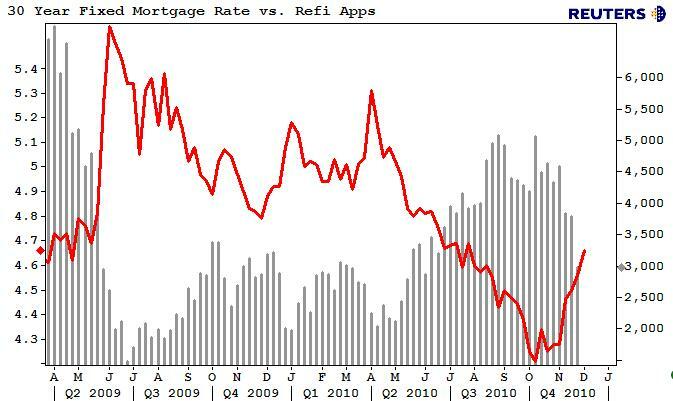 Plain and Simple: Purchase apps continue to slowly rise along with interest rates while the floor has fallen from underneath refinance demand. One has to wonder if improved purchase demand is a factor of mortgage interest deductibility possibly going away or if it’s related to increasing borrowing costs. ← Have a safe and wonderful Thanksgiving holiday weekend!